Supersedure Cell or Emergency Queen Cell? In any case, an open supersedure cell full of royal jelly was found on July 1. The new queen should have emerged by July 16. The virgin queen has 20 days to mate after that, which would have been the day after I heard the piping (but couldn’t see a queen). Six days later I found the brood frames full of royal jelly. So my guess is the queen mated just in the nick of the time and the piping indicated that she was getting ready to start laying. I’ve read nothing conclusive about piping queens, so for now, that’s my personal theory on piping. P.S. : I try to write everything on Mud Songs in a manner that’s accessible to first and second year beekeepers still learning the basics. But that task has become increasingly difficult as the knowledge (i.e., confusion) I gain from the experience of beekeeping increases. 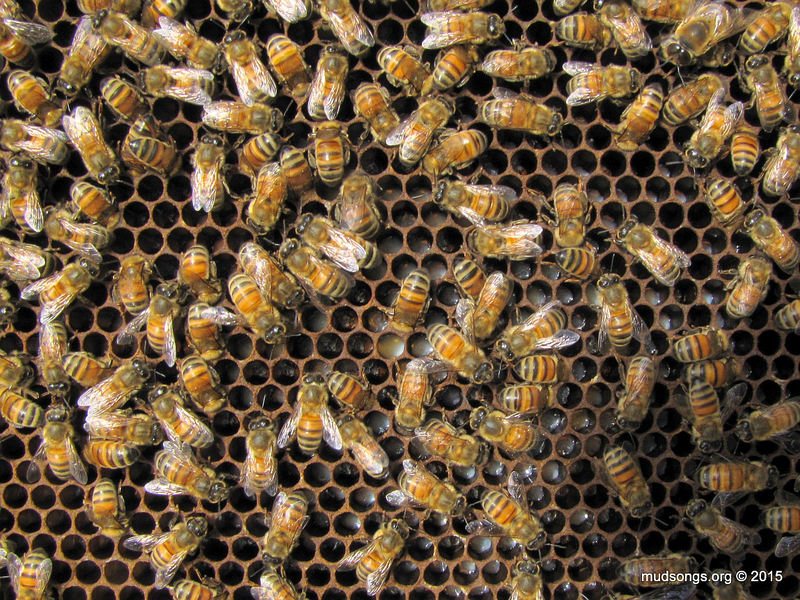 Each topic in this post deserves specific attention: royal jelly, swarm cells, supersedure cells, emergency queen cells, piping, virgin queens, mated queens, brood development, laying workers, drone-laying queens, etc. But that would expand the size of this post by about ten times. So I just have throw some things out there and hope they stick, or at least pique curiosity so that anyone interested will inquire further to figure out what I’m talking about. This entry was posted in Inspections, Month of August, Nucs, Open Brood / Eggs, Queenless Colonies, Queens, Royal Jelly, Sounds, Splits, Supersedure Cells, Year 2015. Bookmark the permalink.